124 Results, Ordered by : Price m² N. Bed. 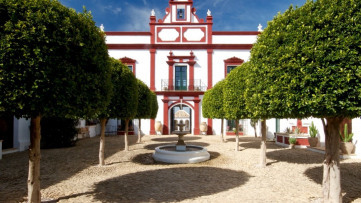 The Palacio is one of Andalucia's finest country houses, located just 30 mins south of Seville. 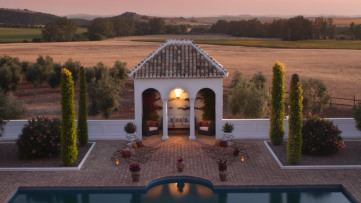 The former summer residence of the Duke of Pilares and his family from Madrid, the Hacienda would make the perfect luxury Boutique Hotel in the middle of unspoilt rolling countryside. The property offers TOTAL peace and tranquility, and is a beautiful and charming home. The Hacienda is steeped in history with period features throughout, and in recent years has been the subject of an extensive and sympathetic restoration, making it an ideal place to rest and enjoy nature as a wonderful antidote to the hectic modern world. The Palacio really is the perfect place to relax! There is only pure silence and tranquility ... and wonderful views in every direction. All this complements its location, which is perfect ... only 10 minutes away from 3 pretty whitewashed villages, each with excellent restaurants, supermarkets, medical facilities, and friendly locals! Additionally it is exactly halfway between the wonderful and impressive booming capital of Andalucia, Seville, and the equally beautiful cliff-top historic town of Ronda. 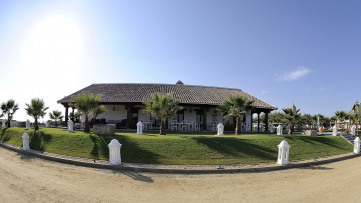 This property is located amidst mature olive groves, fields of sunflowers and cereal crops. 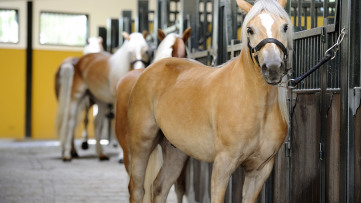 The location is ideal for outdoor recreational pursuits such as horse riding, walking, paragliding and cycling. 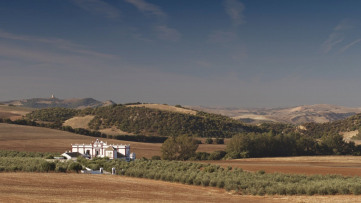 It is close to the National Park of Grazalema, and golf courses in Arcos de la Frontera, Seville and Antequera. Not far away is the lake of Zahara, the historic caves of Ronda, and finally, there are excellent hunting areas. 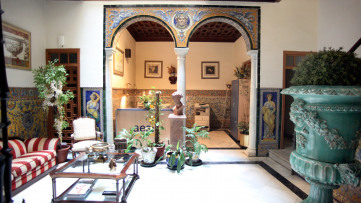 The Palacio is perfectly placed so guests can enjoy exotic Andaluz culture in the cities, and fine dining in local villages and award-winning Michelin starred restaurants in Ronda, Sevilla, Jerez and Cadiz. The Palacio is a highly traditional Hacienda approached via its own private avenue bordered by mature trees, which leads to an enormous walled courtyard with abundant parking and a garage. Impressive wrought-iron gates lead through to a wonderful original cobbled courtyard, where established trees create cool shade amid the intoxicating sound of the antique stone fountain. Bougainvillea and Oleander decorate and perfume the colourful entrance. 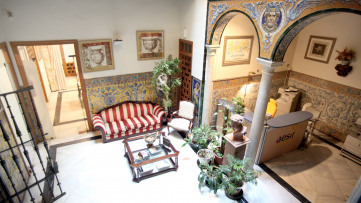 The generously proportioned accommodation boasts 7 suites, 5 of which are located around the central courtyard, each enjoying the luxury of their own private terrace. 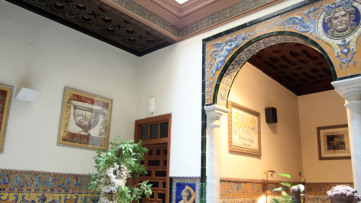 Also accessed from the courtyard is an absolute gem ... a stunning Moroccain-inspired Hammam and heated indoor pool! 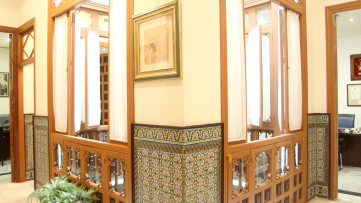 The main 'house' offers palatial accommodation over two floors. It contains a farmhouse hand-made kitchen (including an Aga! 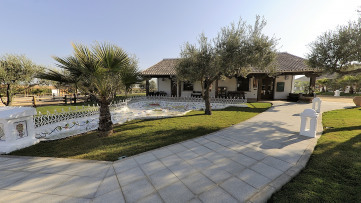 ), with an external terrace where you can enjoy dining al-fresco. There is also a huge Drawing Room, also with a private terrace. On the first floor there is a large landing area, which is currently used as an office, with fabulous views via French doors, plus 2 'honeymoon suites' of more than 100 m² each, again boasting their own private terrace. To the rear of the main house we find the main family swimming pool, 13.5m x 7.5m, and a huge tiled terrace. A pretty gazebo is the perfect place to relax with a glass of local sherry and to fully appreciate the majesty of the property's main facade. All rooms have their own heating with wood-burning stoves. The property is connected to the electricity grid (buried underground) and has its own private well with an abundant supply of spring water. A satellite system connects tonthe outside world, with WiFi connections, and most mobile 'phones also pick up 4G from one of the local villages, El Coronil. In total there are 3.5 Hectares of mature olive grove, and accommodation totalling 1.200m² (plus a further 2,000 sq m of terraces!). 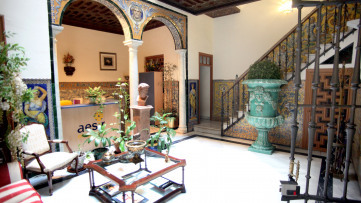 The Palacio is just 30 minutes from Seville International Airport, 1 hour from Jerez airport, 2 from Malaga airport and 2.5 from Gibraltar. It is very well connected.